The cinnamon pull-apart bread made its round in the blogosphere a while ago – and boy, was it tasty. But I was intrigued when I saw the other side of the coin – the savory version at Pink Parsley. I modified a bit, the cheese and herb looked good, but I had a real craving for caramelized onions and feta cheese. I also substituted regular flour for bread flour. I loved it. My sister, H., who isn’t crazy about onions, liked most of it, but the middle pieces which tend to have a lot of filling were too much for her. Dragging the slices off the bread satisfies a childish tendency in me. Three smallish red onions, chopped. Approx. 200 g. feta cheese. 2 tbsp margarine or butter, melted. 1. Mix water, sugar and yeast in a large bowl. 2. Add 2/3 of the flour. Mix until the flour is integrated in the wet, then add the rest gradually while mixing. 3. Turn out on a clean and lightly floured surface, and knead well, until the dough is smooth. 5. The last half hour/15 minutes the dough is resting – make the filling. Caramelize the chopped onions with the sugar, margarine/butter and basil in a pan until the onions are soft and golden around the edges. Take it aside, and let it cool down. 6. Give the dough a punch, and take it from the bowl to a lightly floured surface. Let it rest while you melt the 2 tbsp of margarine/butter. 7. Roll the dough to a 30×50 cm rectangle. 8. Brush with the liquid margarine/butter. 9. 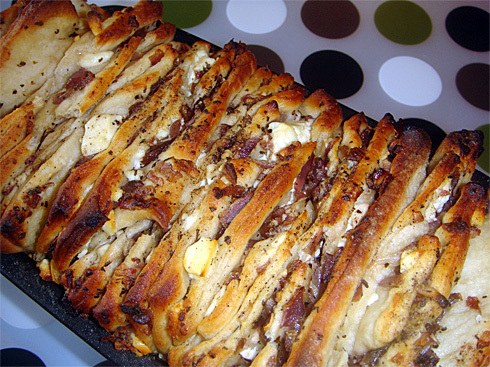 Sprinkle the dough evenly with the caramelized onions and crumble the feta cheese on top. 10. Cut the dough in equally sized strips – about 5-6. Stack the strips on top of each other, and cut into equally sized squares. 11. Grease a loaf pan, and stack the squares into the pan sideways. Any filling that falls out on the way from the cutting to the pan, can be put on top afterwards. 12. Brush with the remaining liquid margarine/ butter. If you want – adding a bit of sea salt to the top can also be tasty. 13. Cover the pan and let the bread rise for 40 minutes. 14. Preheat oven to 175 degrees celcius. Bake the bread for about 35-40 minutes. After about 20 minutes, I had to cover parts of it with foil so it wouldn’t burn. It is okay the next day, but it is really best eaten the same day.